Flight Crew (, translit. 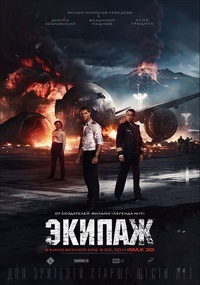 Ekipazh) is a Russian disaster film directed by Nikolai Lebedev and produced by Russia-1 Channel which released in April 2016. It stars Vladimir Mashkov, Danila Kozlovsky and Agne Grudyte. Inspired by the 1979 Soviet film Air Crew, it was the second disaster film shot in the Russian Federation. The film was shot with digital 3D cameras and become the second Russian film released in IMAX after Stalingrad. The premiere took place on April 21, 2016. The film received positive reviews from critics, who praised the special effects, action sequences, acting, and the tense atmosphere. The film was a box office success, becoming the highest-grossing Russian film of 2016. At the 2017 Golden Eagle Awards, the film received 11 nominations including Best Feature Film, Best Director (Nikolai Lebedev) and Best Actor (Kozlovsky), winning five (Best Visual Effects, Best Supporting Actor for Sergey Shakurov, Best Music, Best Film Editing and Best Sound). This webpage uses material from the Wikipedia article "Flight_Crew_%28film%29" and is licensed under the GNU Free Documentation License. Reality TV World is not responsible for any errors or omissions the Wikipedia article may contain.